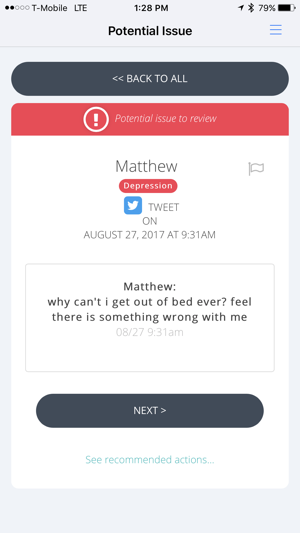 Bark detects messages containing cyberbullying, sexting, signs of depression or suicidal thoughts, and many others -- without you having to spend hours reading all of your child's messages. Bark supports dozens of popular social media platforms, along with email, and text messaging. Children spend an increasing amount of time socializing online. Unfortunately, new technology creates new risks. Parents need a smarter solution to help keep their children safe online without sifting through their social media feed or randomly grabbing their child's phone and scrolling through their messages. 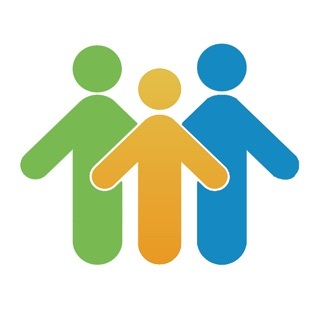 You connect your children's accounts and we notify you if and when there's a potential issue. This approach helps to build trust and an open dialog with your family around internet safety. "My wife and i LOVE Bark - we’ve had some tough, but productive conversations with our 13 year old son. It’s proving to be extremely valuable." - Josh L.
"Bark notified me that my young daughter had unknowingly revealed her phone number to strangers on Twitter. The fact that bark.us notified me in realtime was impressive and led to an informative discussion with her the same day." - Jon B. "We had a couple notifications come through and we were thankful for those. It opened up a dialog with our son which was great." - Nicci C.
"I wanted to say thank you. Bark is really providing me some peace of mind as a parent, and my kids appreciate the extra privacy I'm giving them." - Ray F.
my mother has lost complete trust in me since this app. i have been perfectly fine on my own and ever since this disgusting thing my mom has been going crazy with the overprotective stuff. i get that maybe it can be helpful to see if you’re child is depressed, but this is not the way to do it. and if you are using this app to make sure you kids aren’t doing inappropriate things, then still don’t use this app. just talk to them. give them reasons not to so they can stop on their own. this is a complete invasion of privacy and not fair to the child. i get it, phones are scary, and there are a lot of dangers and stuff on the internet, but i said this before and i’ll say it again. this is not the way to do it. if you’re a good enough parent you shouldn’t need this. just talk to your child. please. for my sake and all the other teens and children with overprotective parents. 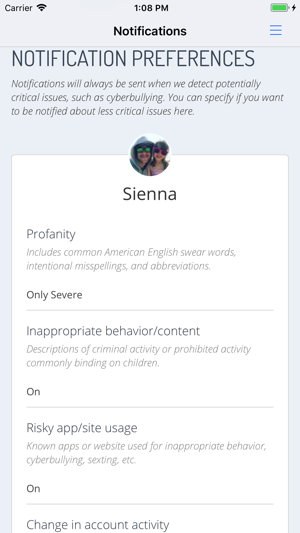 the app has the right idea, but there are so many parents out there who can abuse that power. so if you’re thinking about getting this app for your kid, don’t. there are so many other ways. get therapy or go to a doctor if they’re depressed, and if you’re scared they’re posting or sending inappropriate things, warn them, or just back off a bit, it might not even be as bad as you may think. sorry for the 1 star Bark, this may give my mom a lot of things but it can’t bring back the trust i had with my her and i can’t let that happen to anybody else. We have tried other monitoring systems and they have been either complicated to use (especially with 2 parents trying to use them). Or they have limited too much for our older children when we also need the max amount of monitoring for younger children. This is particularly frustrating for homeschoolers who need internet access for school. Bark is not a site blocking tool, it monitors and alerts parents to any and all questionable words/acts/images. The set up was easy (even with 6 kids and even more devices). I had trouble figuring out how to install bark on 4 chromebooks, but after I reached out to bark via fb messenger, they replied immediately and thoroughly. They sent me instructions, and followed up with how we were doing in the same day. 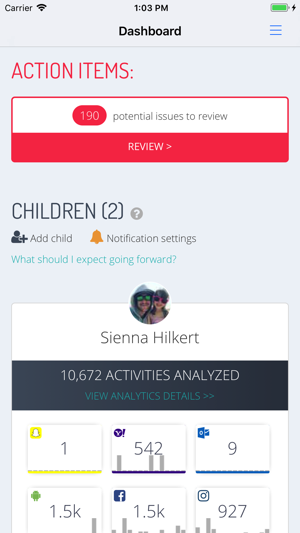 I would never be able to monitor all my kid’s phones and devices without the alerts bark provides. This saves me hours (that I would not be able to do!) 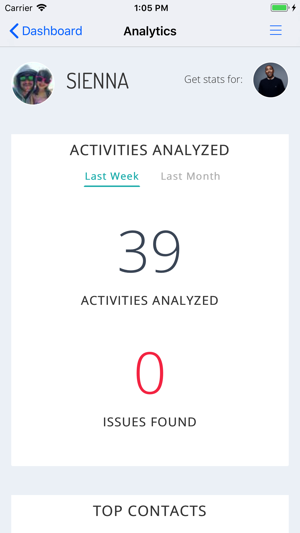 in checking multiple devices, apps, and message conversations regularly. Bark doesn’t limit my older kids on where they need to go on the web, and it alerts me immediately if there is any kind of concern. We have already had to speak to our children about how to text and message others with respect (cyber bullying alerts for siblings calling each other names). My children are now understanding that bark monitors, parents see, and others will always be able to find what one sends or views on the Internet. This is an important life lesson! I’ve had this app for a couple weeks now and I love it! First I want to say that the customer service is excellent. I used the online chat within my app and had a quick response. The person walked me through my issue. It was great. And I love how I don’t have to comb through all the child’s text messages- leaving them with some privacy. Instead Bark sends me notifications when they detect an issue with something. I have gotten alerts for texts, Snapchat and instagram. And if I have concerns and want to read through the text messages I have that ability. © 2017 Bark Technologies, Inc.